President Mnangagwa’s pledge that Zimbabwe is “open for business” rings hollow. With a recent surge to an annual inflation rate of 236%, protests have sparked. As long as Zimbabwe continues to produce its own money, namely bond notes and RTGSs, it will continue to be held in a monetary death grip. 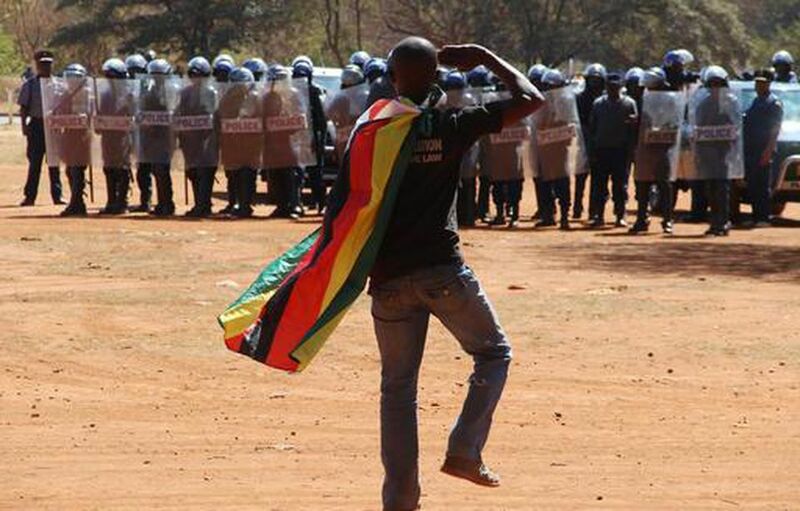 Riot police watch a man with a Zimbabwean flag over his shoulders saluting during a protest in Harare. (AP Photo)COPYRIGHT 2016 THE ASSOCIATED PRESS. ALL RIGHTS RESERVED. 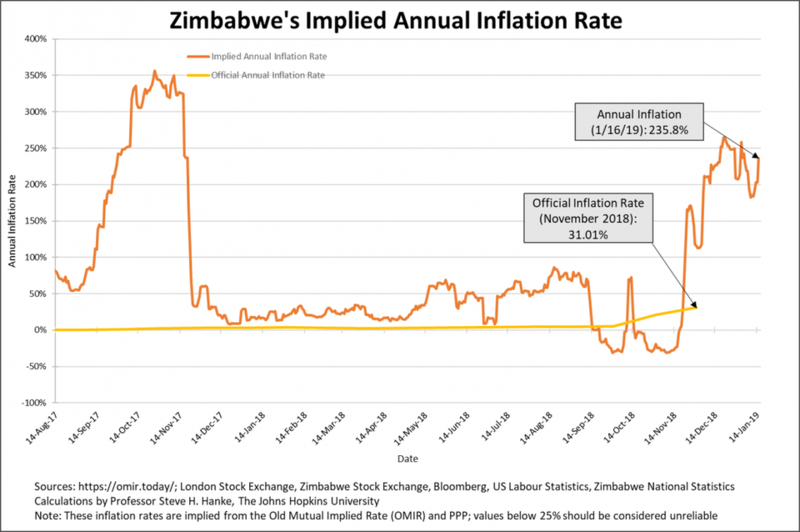 On November 14, 2008, the annual inflation rate peaked at 89.7 sextillion percent every day, making Zimbabwe’s 100 trillion dollar notes worthless. In the end, the government was forced to scrap the Zimbabwean dollar, because Zimbabweans simply refused to use it. Mugabe’s ZANU-PF government then instituted a system in which the United States dollar became the coin of the realm. Government accounts became denominated in United States dollars in 2009. As a result of this dollarization and the installation of a national unity government in 2009, the economy rebounded. That rebound persisted during the term of the national unity government, which lasted until July 2013. During this period, real G.D.P. per capita surged at an average annual rate of 11.2%. The minister of finance, Tendai Biti, who was a member of the opposition, understood that under a dollarized regime, the country would no longer be able to print money to finance deficits. Consequently, budget deficits were almost eliminated. With the collapse of the unity government and the return of Mugabe’s Zimbabwe African National Union-Patriotic Front party, old habits resurfaced. The fiscal deficits ballooned— something that should not happen under “dollarization rules.” But, Mugabe would break any rule. To finance its ballooning deficits, the government began to issue an enormous number of “New Zim dollars” in 2013. With that, Zimbabwe abandoned dollarization and started to issue its own money. The new monetary liabilities issued by the government come in two forms—bond notes and coins and electronic real time gross settlements (RTGSs). The chart below shows how the bond notes and coins and RTGSs dominate the broad measure of Zimbabwe’s money supply M3. Indeed, the New Zim dollars make up a whopping 79.65% of M3, with RTGSs accounting for 74.47% of M3 and bond notes and coins accounting for 5.18%. It is important to stress that most of the financial press paints an incorrect picture of Zimbabwe’s monetary regime. Press reports often indicate that Zimbabwe does not have its own money, and that this is the source of Zimbabwe’s problems. This account is incorrect. Zimbabwe has its own money and this is, in fact, the source of Zimbabwe’s problems. This is revealed by the fact that the New Zim dollars are issued at par to the U.S. dollar, but trade at a massive discount to the dollar. It didn’t take long after the government started issuing New Zim dollars for Zimbabwe to experience its second bout of hyperinflation. Remember that hyperinflation occurs when the monthly inflation rate reaches 50% per month and remains above that rate for at least 30 consecutive days. This initial threshold was breached on September 14, 2017, and with that, the 2017 episode of hyperinflation commenced. The chart below shows that episode as well as the troubling recent surge in Zimbabwe’s inflation. It is this recent surge to an annual inflation rate of 235.8% that has sparked the recent protests. What to do? As long as Zimbabwe continues to produce its own money, namely bond notes and RTGSs, Zimbabwe will continue to be in the grips of a monetary death spiral. Indeed, the New Zim dollars are malignant and must be removed. If left in the monetary system, Gresham’s Law will continue to force U.S. dollars out of the system to be put “under the mattress,” causing a huge artificial “shortage” of U.S. dollars. 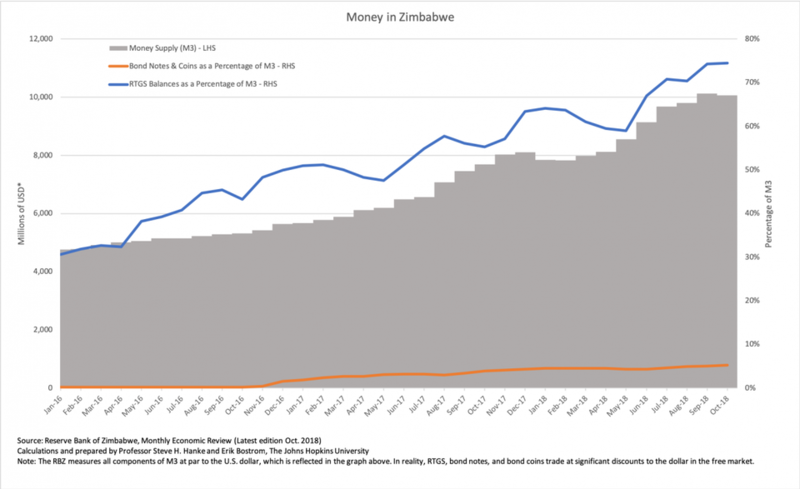 Remember that Gresham’s Law, which was introduced by Henry Dunning Macleod in his Elements of Political Economy (1858), states that “bad money drives out good.” Today, Gresham’s Law is operating on steroids in Zimbabwe. Just how does one remove Zimbabwe’s monetary malignancy before it kills the patient? The government must announce that it will not rob the holders of bond notes and RTGSs. They were issued at par to the U.S. dollar, and they will be redeemed at par by the issuer: the Zimbabwean government. The redemption at par will take place over a five year period. During this period, the government will redeem the bond notes and RTGSs by accepting them as payment for taxes or any other obligations. If credible, the redemption policy announcement will cause the value of the bond notes and RTGSs to climb towards par, creating much-needed liquidity, as well as solvency, in Zimbabwe’s financial system. Zimbabwe’s monetary death spiral will come to an abrupt stop. To run down the stock of New Zim dollars to 2016 levels, $1 billion per year should be redeemed over five years. Then, the patient will be deemed to be in remission, and a clean bill of monetary health can be issued. Zimbabwe will once again have a healthy, superior currency, the U.S. dollar.